Look! Up on the movie screen! It’s a prequel! It’s a sequel! It’s ALIEN: COVENANT! Yes, that loveable Xenomorph XX121, first seen in 1979, err… 2122, is back for more teeth-baring, flesh-eating fun. Fast forward a few years to 2104 and we find the USCSS Covenant en route to Origae-6, a remote, Earth-like planet that will serve as the new home to the more than 2,000 colonists that are on board. Because it’s a seven-year journey, everyone — even the crew, who will also be settling there — are in hypersleep. Only the ship’s synthetic, Walter (also Fassbender), is awake. But when a shockwave from a stellar event damages the ship’s power shields and causes a fire onboard, “Mother”, the ship’s computer system, gives the crew a rude wake up call. In the ensuing mayhem, the ship’s captain, Jacob Branson (James Franco, THE INTERVIEW; WHY HIM? ), whom we only see in a video he made for his partner, Daniels (Katherine Waterston, FANTASTIC BEASTS AND WHERE TO FIND THEM), before they left Earth, is incinerated before the others can get his sleeping pod open. With no time for tears, the crew goes out on a spacewalk to perform essential repairs to the ship. While out there, they intercept a radio transmission, which they trace to a nearby planetoid that, lo and behold, is not only Earth-like, it seems even more hospitable than Origae-6 is. The ship’s new captain, Chris Oram (Billy Crudup, JACKIE) makes the decision to head to this never-before-charted planetoid with the intention to settle everyone there rather than remain on their original course and send everyone back to bed. When they arrive, though, it doesn’t take too long before everything goes pear-shaped as some members of the landing party get infected with a new alien, referred to as a Neomorph. Though the surviving members are rescued in the nick of time by a familiar face, the real excitement has only just begun. ALIEN: COVENANT is the second part of a planned trilogy, or even tetralogy, that will ultimately lead into the original ALIEN film and its sequels. (Let’s all forget about the AvP spinoffs, shall we?) So, while there’s no Ellen Ripley (a role made iconic by actress Sigourney Weaver) in this film, at least we are beginning to understand how Xenomorphs came into being. 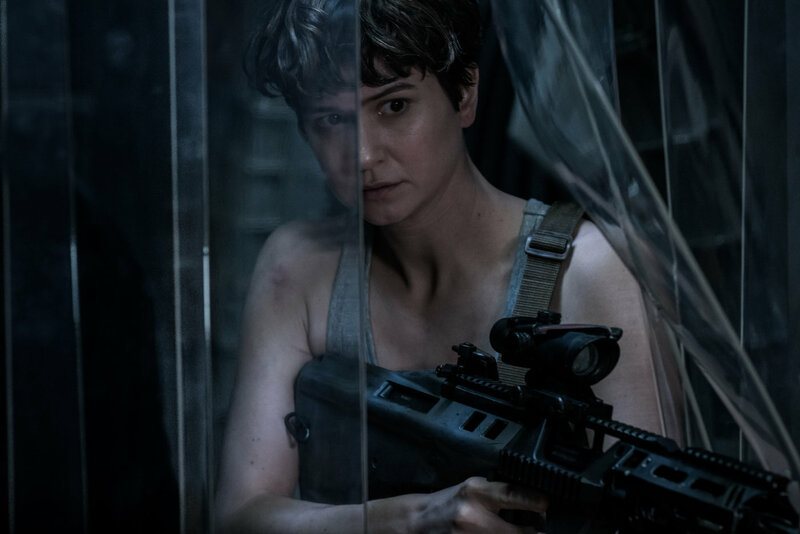 However, unlike the first two ALIEN films, COVENANT doesn’t offer up much bone-chilling fear. Blood and gore, yes. Terror, no. Perhaps it’s because we’ve seen the Xenomorphs so many times already that we’ve become immune to watching squishy things burst out of people’s chests, backs or mouths. Also, COVENANT treads a very familiar path of supposedly smart people making a succession of dumb decisions that lead up to a final encounter in a vapour lock that may or may not kill off the bloodthirsty alien being. Didn’t we just see this story in the highly derivative LIFE a few months ago? This is basically a haunted house in space film. The best part of COVENANT by far is Fassbender in the dual role. He does androids very well, even two that are identical in appearance but quite different in temperament. Both David 8 and Walter have personality, which is more than we can say for their mortal counterparts. As we watch each one of the humans get bumped off by the various aliens in succession, we can’t help but feel sheer indifference to their plight. Strangely, a few key pieces of information seem to have either been left on the cutting room floor or director Ridley Scott made a conscious decision to relegate them to a couple of prologues, entitled “The Crossing” and “Last Supper“, which are available for viewing on YouTube. If you haven’t seen PROMETHEUS and you’re planning on seeing COVENANT, I recommend you watch them. If you don’t, you’ll have to accept some relationships and situations in COVENANT as de facto. All tolled, ALIEN: COVENANT is a slightly above average space thriller. It’s better than PROMETHEUS but not half as good as the first two ALIEN films. Daniels is no Ripley, none of the other human characters are memorable and you’re not going to have nightmares from watching it. Listen to the review recorded on RTHK Radio 4! Go to “Part 2 (HKT 08:05 – 09:00)” and slide the timebar over to 28:15. Better than Prometheus for me. Nice review.